Jumbled emotions, frazzled nerves, and tired feet! So how am I feeling after this whirlwind weekend? Awesome!! My youngest kids graduated from high school and are making plans for college at Kansas State University next fall. 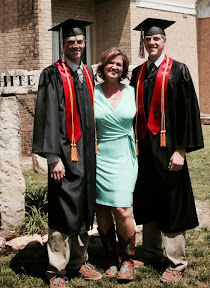 I'm so very proud of my boys (yep, they are twins) but I will really miss this parenting stage! High school kids are really great. I suppose that is not jut because it follows the rough stage of junior high, but because high school kids are young adults who still really need their mama. Couple graduation with Mothers Day and that makes for an emotional weekend for me! Let's just say I may be a bit dehydrated and tissues are on my shopping list. My husband likes to set goals and we ended the weekend with making predictions and setting goals for 10-years from now. I'm proud to say at least two of my five kids hope to be home on the ranch within 10 years. I guess we will report back in 2024 to see how many predictions and goals come true. Great photo from graduation! I can only imagine how emotional the weekend would have been having the last of your kids graduating high school and then adding in Mother's Day. Congratulations to the boys and you and your husband on the landmark weekend. Val, I pretty much sobbed all weekend! But my kids are used to it! They actually make bets on when the tears will start and if I can hold it in at certain times! My son was the valedictorian and gave a speech, so I bawled through the whole thing!! Kim that is great insight! I agree, adult kids take getting used to, but they are really really awesome! I have enjoyed each stage of life as it comes...each has been better than the last! Now, I get to meet my husband again. Incidentally, we also celebrate our 25th anniversary this month. Ohhhh boy!